The book, the shipping, are all as good as promised. Thank you very much! I will buy book from you again. Book was in great shape. Excellent story, would definitely recommend it. After reading The Forgotten Garden I was eager to read another work by Kate Morton. And while The House at Riverton was just as well written, I found the plot less to my liking. I'm not going to summarize the book, since countless other reviewers have already done that and this is not a book report, after all. I will simply say that it is a story about the Hartford family in the early years of the 20th century. Everyone in the family (except one and I won't say who that is as that would be a spoiler) leads a mostly sad and unhappy life before meeting an early and tragic death. Perhaps the most tragic of all are the two sisters Hannah and Emmeline, around whom the plot revolves. Just as in her other book The Forgotten Garden, Morton tells what could easily become a sordid tale without ever letting it become so. The House at Riverton is a thoroughly sad story with very few bright spots in it, and yet thankfully Morton does not allow it to becomde dark or disturbing. Unfortunately, the central core of the story is a tale of illicit love and adultery. Again, Morton does not get explicit. Even so, these are themes that are contrary to my personal values and so this book is not one I will keep or ever re-read. Another reviewer commented on Morton's use of the "f" word near the end of the book; I, too, was extremely disappointed that the author felt the need to insert such language into the book. That alone cost the book a star. It was conspicuous to me that all of the Americans in House at Riverton were obnoxious and boorish. And while I wasn't offended by this as some other reviewers were, I do think it was a poor choice for Morton to give such a one-sided and unflattering portrayal of Americans. We don't hold the monopoly on bad behavior!!! She could have made at least one American a sympathetic character (Teddy probably came the closest, and then only because he was trying to be English), and/or made some of her unpleasant characters be something other than American. The American tourists were especially uncouth - I thought that was unfair, really. 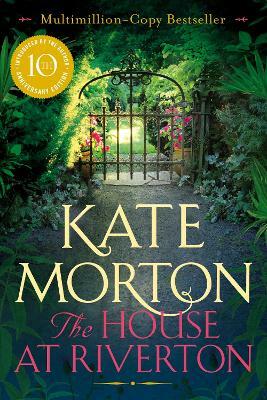 Both of Kate Morton's books are well-written; there is no doubt that she is a highly gifted writer. However, after the House at Riverton my feelings about her work are more mixed, and whether I will read her next book is uncertain. The Forgotten Garden also included an element of adultery, but it was not so central as in The House at Riverton. Perhaps with her third book Kate Morton will just leave it out entirely. That would be nice. This is the very best First BOOK I have ever read. Words fail me when I try to review this unbelievable story. Kate Morton achieved the sophistication of Anne Rivers Siddons and Rosamond Pilcher with her first book. Hard to believe that the second was even better. I can't wait for a third. I love those movies that occur in the British mansions around the turn of the century but have always had a problem reading stories about them. They always seem so formal, slow, and I tend to get a little bored. "Riverton" was a hit for me simply because I was never bored and did not have that drag. The writing flowed easily and was never dry. I've seen some reviewers call it a mystery but I don't see it as a mystery so much but more as an evolution of an event you already know is coming. I would best describe it as a cross between "Atonement" (withouth the drag) and "Titanic" (without the action).